Utilize two stage method of heat absorption and exothermal to recover exhaust heat, The separated design can ensure the exhaust and fresh air are in different channels. 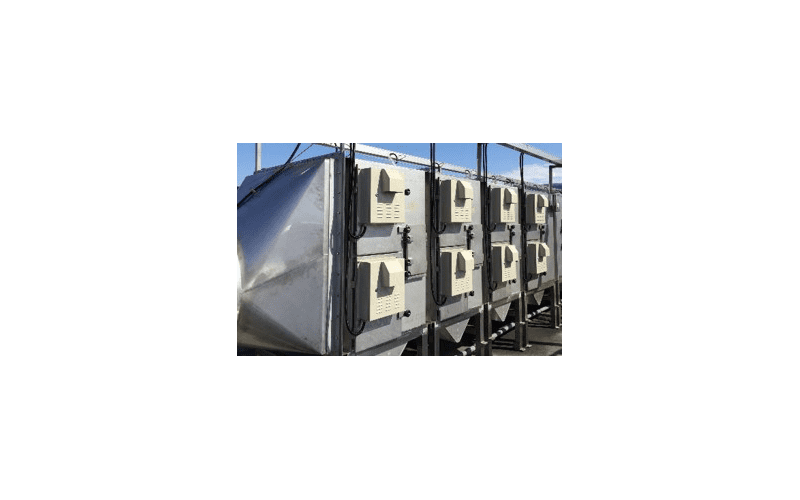 The heat can be recovered into hot air or hot water type. 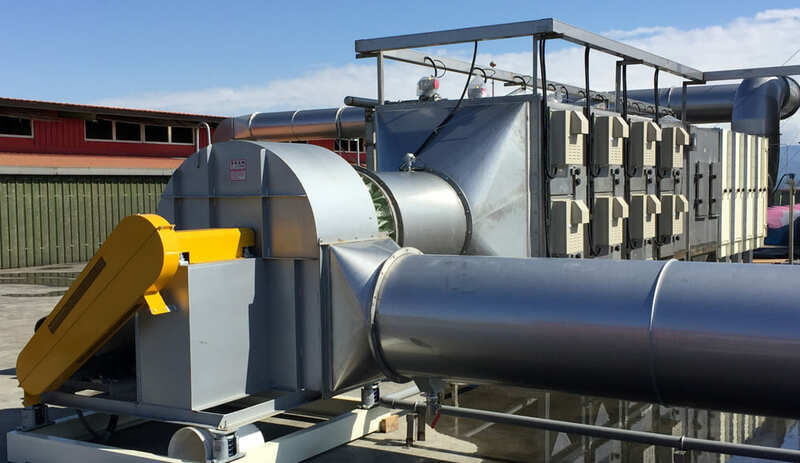 Meanwhile, the exhaust can be cooled and de-oiled at the front section, then release to the atmosphere after purified at the late stage by water scrubber or electrostatic precipitator. Heat absorption single unit adopts heat exchange tubes which are fully covered with aluminum fins. The heat absorption efficiency is good. Access door between single units is designed for easy maintenance. 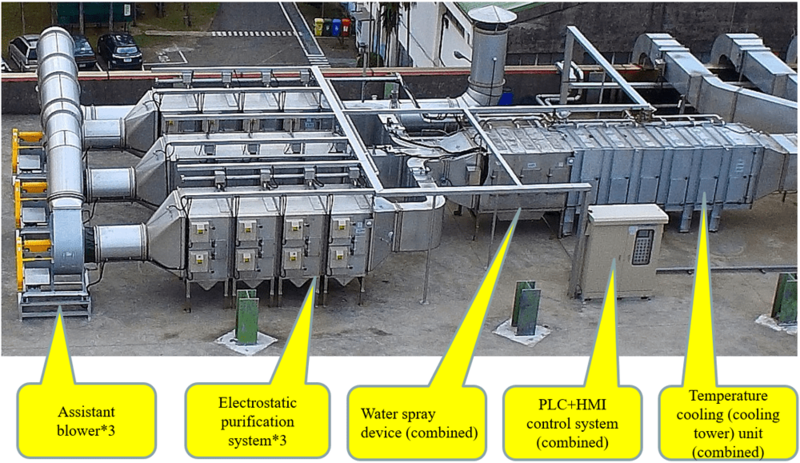 Water spray design can setup for regular cleaning (controlled by PLC). 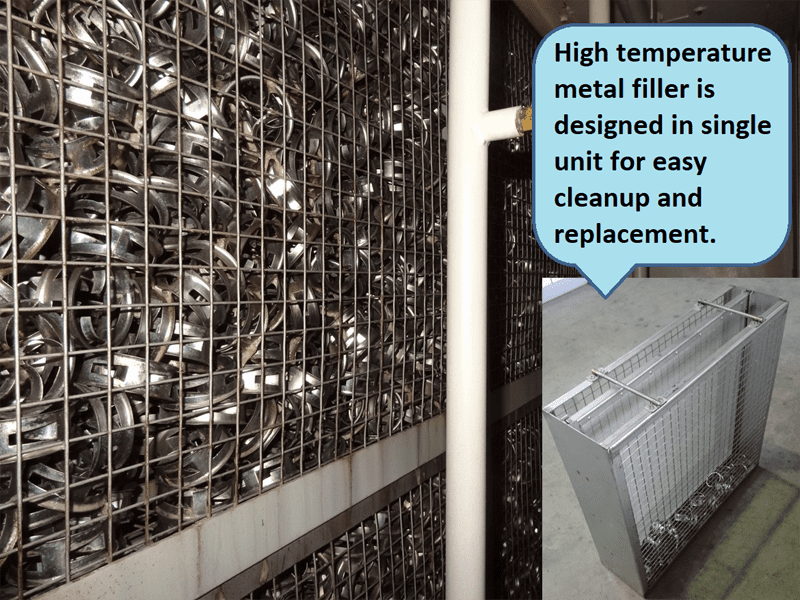 Can combine with plate heat exchanger for heat recovery (optional). Temperature detection for fire alarm system. 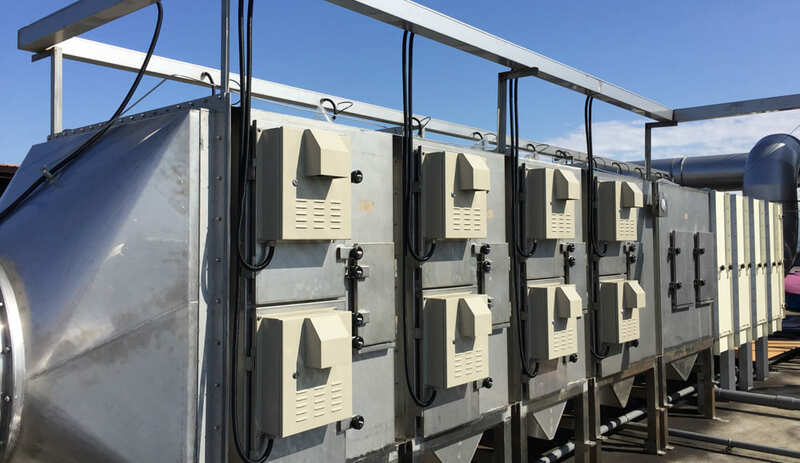 Heat dissipation type adopts cooling tower (standard). 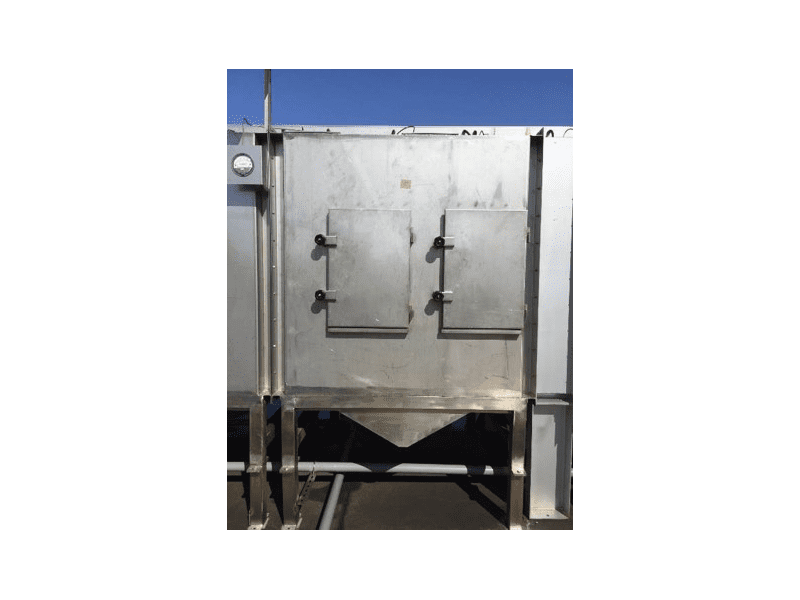 Collecting oil and water into oil-water separation tank to efficiently eliminate the oil dirt. 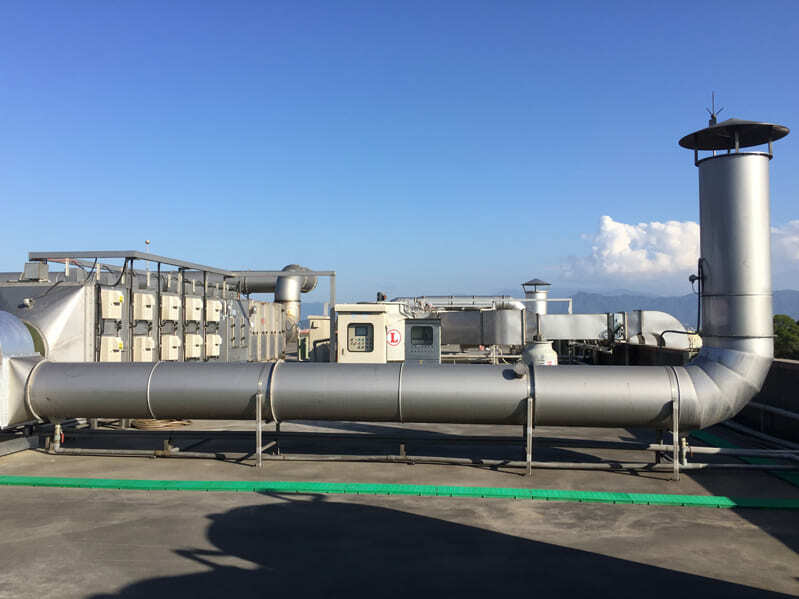 Heat recovery type: Exhaust gas temperature (140~180℃). 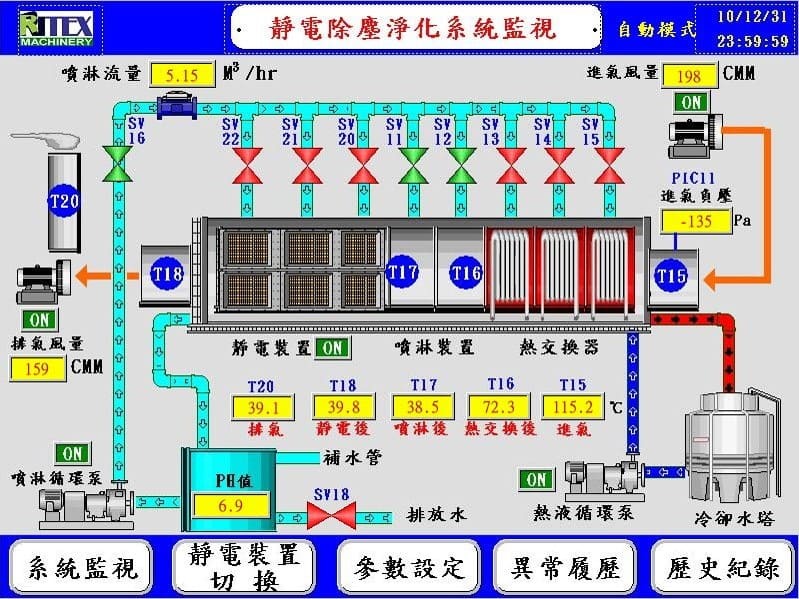 Design to recovery hot water (50~60℃) for process use. At the same time, cooling exhaust gas temperature to under 80 ℃ to effectively condense gas mist into liquid material particles. 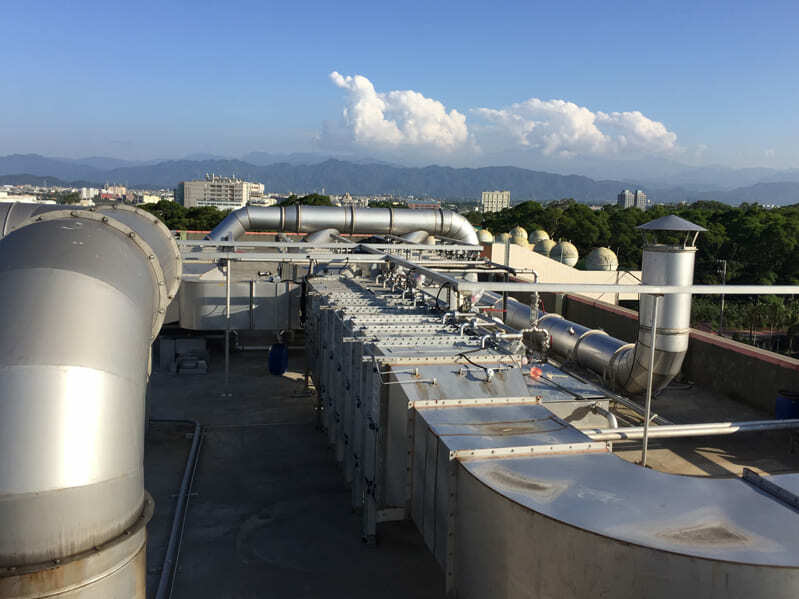 Heat dissipation type: Exhaust gas temperature (140~180℃), Design to cool down exhaust gas temperature to under 50 ℃ by cooling tower to effectively condense gas mist into liquid material particles. 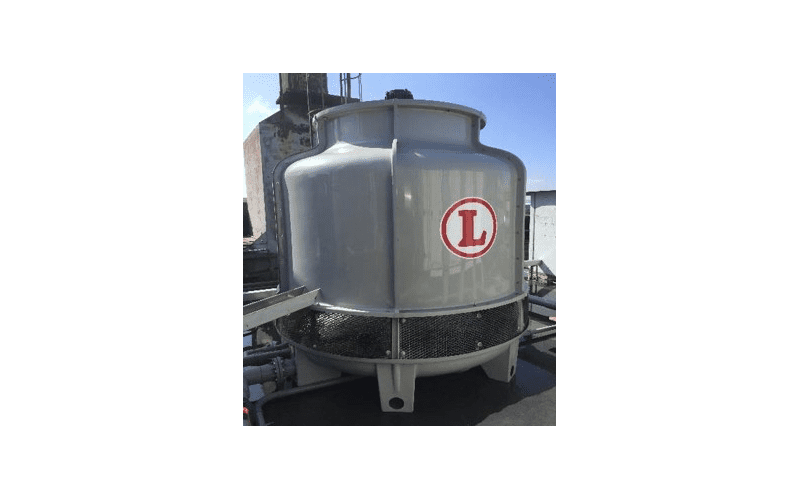 Collect the water-soluble substances and large particles in the exhaust gas, then condense gas mist into liquid material particles again to cool down exhaust gas temperature to under 40 ℃. Use electrostatic plates to collect water mist particles. 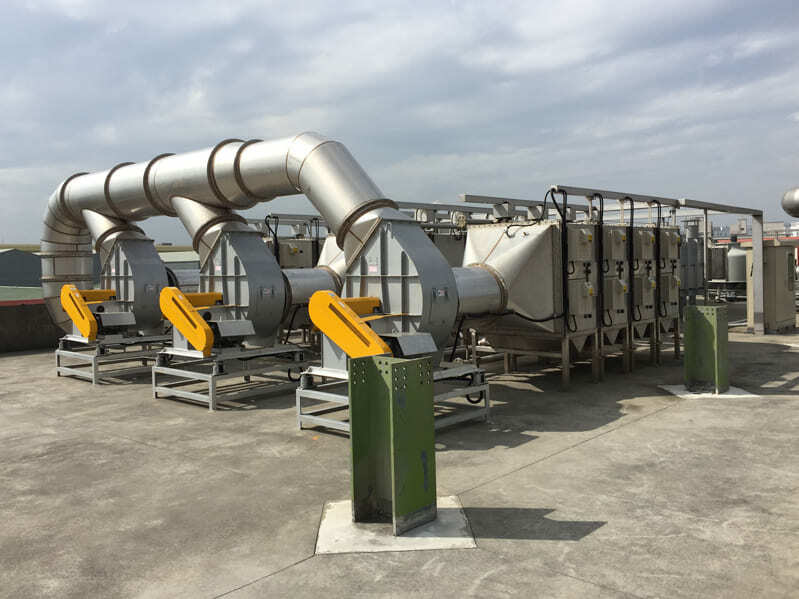 Before entering into electrostatic collector plate set, the exhaust gas temperature must be under 40℃. 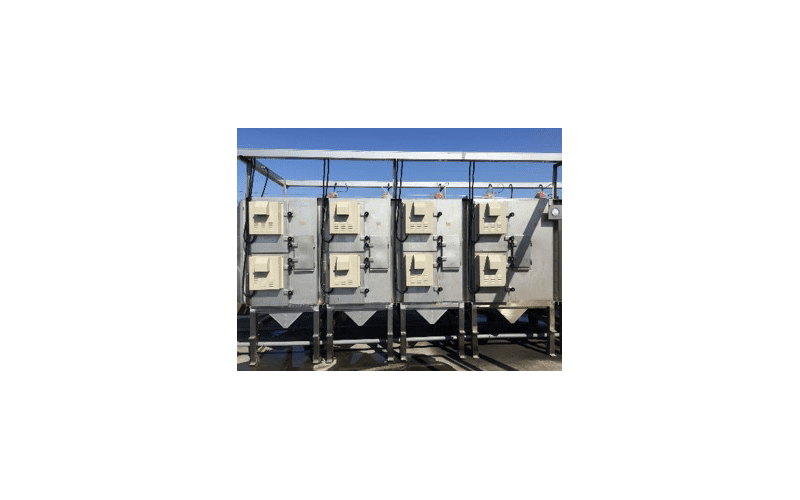 Use electrostatic plates to collect water mist particles and particulate matter that can’t be treated at upstream equipment. Cooling can avoid class B and C fires. Water spray helps particle condensation nuclei grow and enhance the collection efficiency of deep submicron particles (PM2.5). The electrode plates will form a uniform water film to prevent channel drying. The particles can be removed via a continuous water flow to maintain high performance. Avoid discharge electrodes being attached to particles and prevent short circuits and sparks. 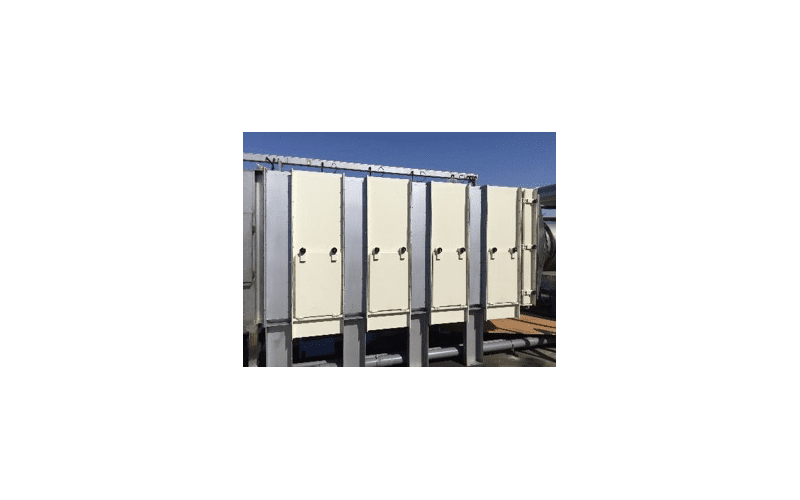 Can handle dry dust and particles with high humidity, acidity, and viscosity at the same time. 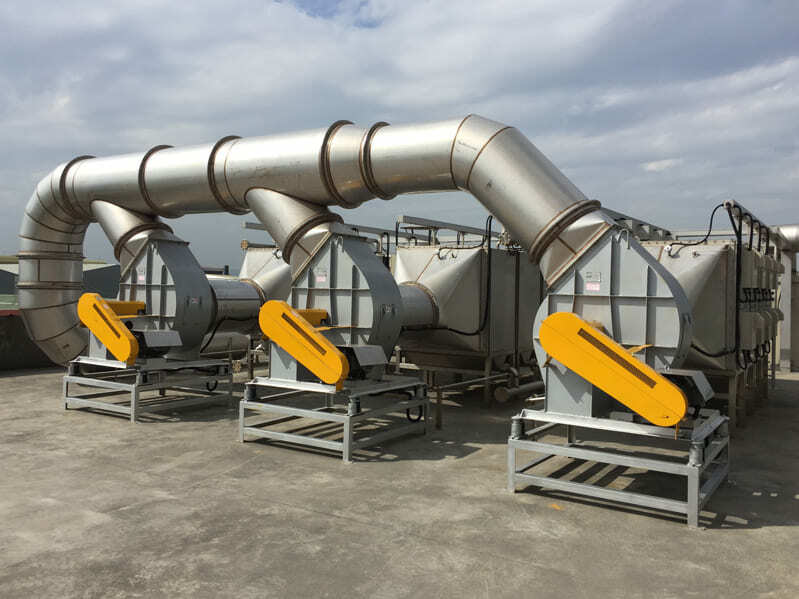 Cooling + water spray + electrostatic precipitator (oil), 3 stages processing procedure to eliminate oil mist particles effectively. PLC+HMI auto control exhaust link system actively combine with the changes of stenter exhaust to reduce energy consumption；meanwhile, connect with stenter fire alarm and water spray system to minimize the fire risk. 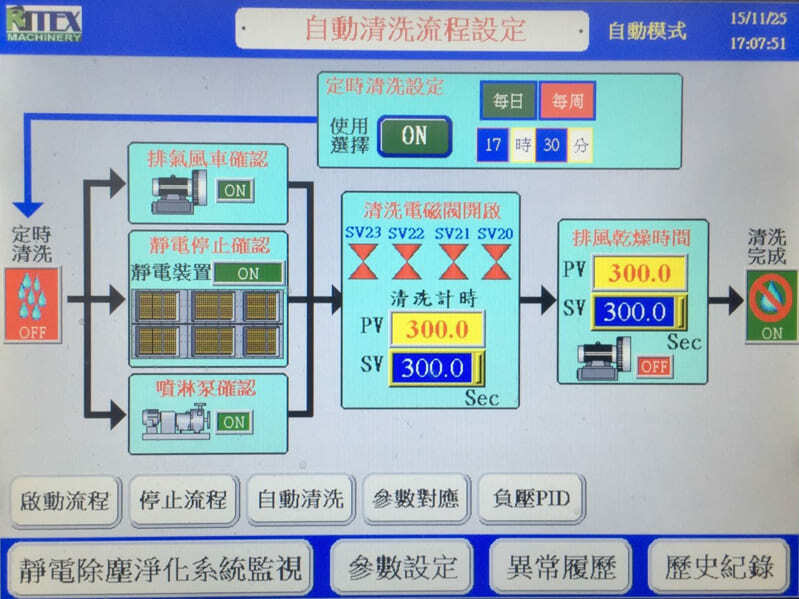 PLC+HMI auto cleaning design which can improve the equipment efficiency and reduce the frequency of cleaning manpower to save cost. PLC+HMI data management and recording including settings of the limits of maximum and minimum operating conditions and the parameter management of alarm error to ensure the system works normally. Modular design, easy maintenance and repair.